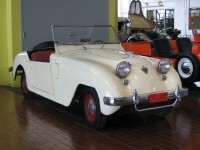 The Crosley automobile was the brain child of Powel Crosley, who had already made his fortune as a direct-mail marketer, a radio and appliance manufacturer, owner of WLW (the "Nation's Station") and the Cincinnati Reds baseball team. 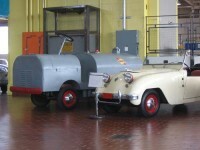 Probably the most advanced automobile manufacturer in America during the post-WWII years was Crosley, a radio and refrigerator manufacturer. Powell Crosley, Jr. is famous for making millions by producing Crosley radios and Shelvador refrigerators. 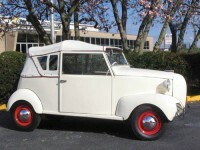 Mr. Crosley also had a passion for cars, and believed America was ready for a small economy car. Everett and Clinton Cushman began making farm machinery and two-cycle boat motors in Lincoln, Nebraska, in 1901. The famous “Husky” single-cylinder four-stroke engine debuted in 1922.